The ancestral village of Koliwada in Dharavi, Mumbai or the rapidly growing village of Aldona, Goa from where we are writing these lines can both be described as “urban villages”. Koliwada, once a quiet fishing village in the outskirts of the city, was absorbed in the growing metropolis in the second part of the twentieth century – like nearly two hundred other villages. Some of these villages have survived as they densified, others have been redeveloped into high-rises leaving no trace of their origins, except the fading memories of elderly residents. What most urban villages share is a history of incremental development. They densified gradually over many decades. Their populations increased internally and they also absorbed newcomers who grew roots over time. Residents shaped these habitats, building shrines and schools, shops and homes, subdividing paddy fields into small plots, implementing infrastructure for water and roads, participating in local governance, sending remittance home from afar, and so on. 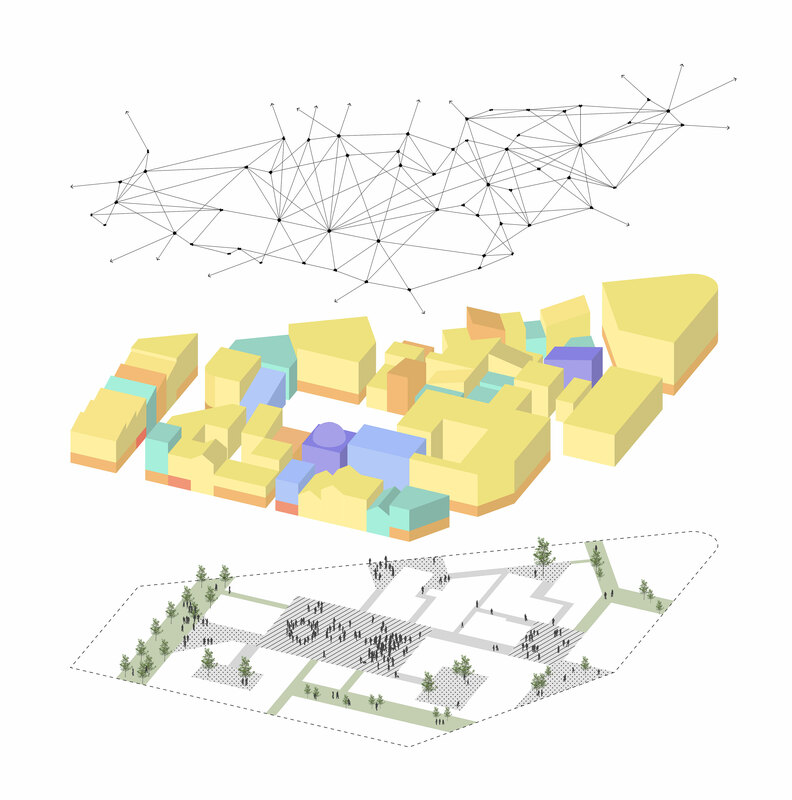 They also share other features that are often associated with village life: they are dense but mostly low-rise, accommodating both residential and economic activities. They host a multitude of community spaces and cultural events, and they provide their inhabitants with a strong sense of belonging. While Mumbai’s urban villages lost their connection to the sea or the fields, many villages in Goa are still surrounded by rivers and greenery. These are qualities that an increasing number of urbanites aspire too, especially in Europe and the US where urbanization has often been synonymous with the atomisation of individuals and families into suburban houses and residential high-rises. At some point in time, this may have felt like a liberation from unsafe and congested cities and oppressive rural villages. But long commutes from work to shopping centres to home, and monotonous, impersonal habitats are pushing people to look for alternatives. Imagine a place where home, work, shopping and open spaces are all within reach by foot through tree lined pathways. A place where kids can play safely in public spaces. A place which blends harmoniously into its natural environment, which making you feel part of a community of like-minded people. Isn’t it every middle-class family’s dream? The list sounds like it could have come from a real-estate brochure advertising a neighbourhood built along the principle of “new urbanism”. The fact is that the urban village has become commoditised. It is being sold in the form of gated communities in the US, eco-cooperatives in Europe or smart cities in India. These kinds of habitats are attractive to those who desire urban comfort without friction, but others may find that they lack the stuff that attract us to cities in the first place such as intricacy, variance, chance... These complications, which challenge us and stimulate our imagination are almost impossible to reproduce in master planned habitats – except if the plan was designed to be tampered with by users. One such plan is Charles Correa’s Artist Village in Belapur, Navi Mumbai. He designed simple structures within an incredibly sophisticated urban grid with the understanding that the inhabitants would takeover individually and collectively. A few cooperatives in Switzerland and Germany have also managed to create more complex urban environments through the participation of their inhabitants. What seems to be key in the making of an urban village is the contribution of many types of actors, over a long period of time. Modern planning methods and the way projects are financed do not seem to allow the kind of incremental growth and user participation necessary for urban villages to come to life. Even in the rare cases where municipal authorities are in control of the planning process, the tendency is for entire neighbourhoods to be delivered and then sold to consumers, who can buy and rent, but will have little say on the physical evolution and social activities of the place where they live. We hope that new ways of producing settlements, which include participation and crowdfunding for instance may change the existing trend. But for now the best urban villages we know of remain the ones that are at the heart of our cities and which we are all too quite to dismiss as inadequate and backward.